How to make a Nativity Model - Show Me WOW! Children love to make things that are effective, simple to put together, that need only everyday materials that are easy to find. They like to make things that do not take too long, so they can soon get the effect and then be inspired to add to the model with their own ideas and designs, so developing the creative skills they have acquired in the early stages of the model making. Such is the design for this Nativity Scene. It is plain and simple, uses small, brown paper bags, fabric scraps and fixers like pieces of string or ribbon to tie and/or a stapler. Each character is made in the same way, the costuming marking their different status. How to make the basic body. Use a brown paper bag…here I have used 1lb bags, but any size would do, so long as you have enough fabric for the costuming. The length of the bag will be a little more than the height of the finished character. Push some scrunched up waste paper into the end of the bag to form the head and secure this paper stuffing in position with a piece of string tied under the character’s chin. Spread out the open end of the bag so that the character can stand up. If this is difficult, then support it over a pot or a cut down inner loo-paper tube. 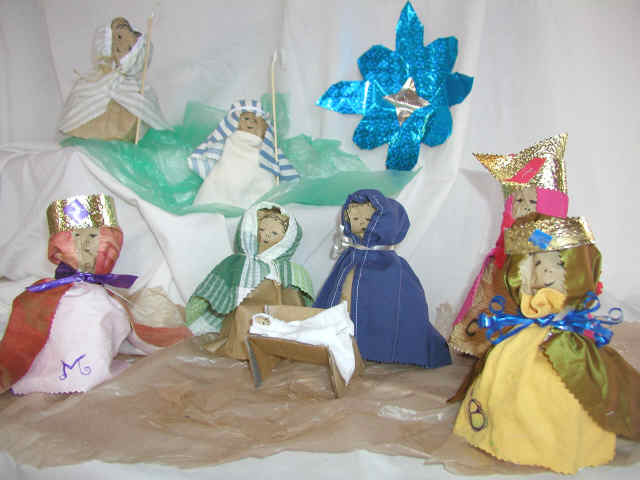 Click here for sequenced cloze procedure work cards on making a Nativity Story Book. Baby Jesus is a brown paper bag rolled tightly and held by sticky tape or a small piece of string. A suggestion of a small sleeping face is added and the Baby is wound in white swaddling clothes. The manger is three rectangles of cardboard cut from a box. One is folded in half and allowed to open slightly to form the cradle shape on which the Baby sleeps. 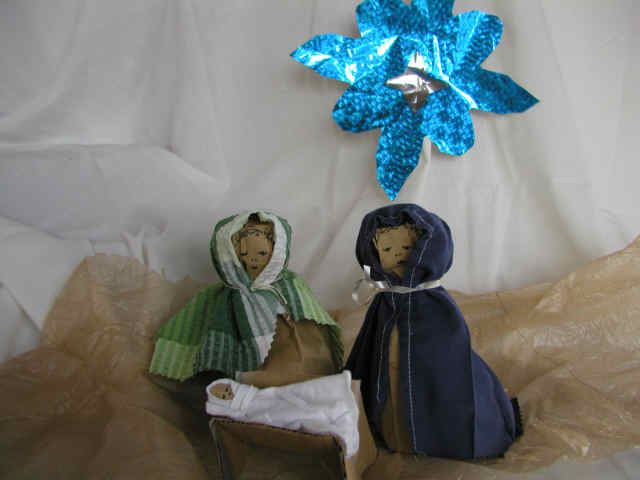 The other two each have a V shape cut out of them to support the first rectangle and to form the “legs” that support the head and foot of the manger crib. Secure with sticky tape. I cut the front legs shorter for a better view of the Baby. A box can be the the stable building, coloured with wax crayons to show stones, bricks, plants. 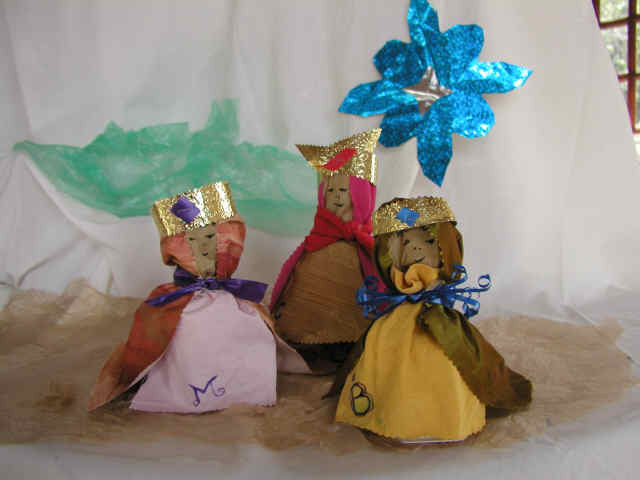 The three kings have the same body pattern, but use richer fabric scraps to dress them and shiny ribbon or rich fabric strips to secure their clothes, whereas string can be used for the poor shepherds. Their head piece is made of a bigger fabric scrap than the shepherd’s, so that it extends to make a train, which may need to be tucked at the back with a staple or a stitch, but, when stretched out, helps the king to stand up. Kings might need extra standing support as their costumes are heavier. Shabby stains on the fabric scraps have been disguised here by adding each king’s initial on the garment where the stain was and using a felt pen. Add a gold or silver crown, maybe with fabric jewels to match each outfit. Don’t forget to make a star ! That is fun to make too.